This tutorial is the eighth in a series of 12 that teach you how to build MVC 5 applications using Entity Framework for data access and Visual Basic. In the previous tutorial you displayed related data; in this tutorial you'll update related data. For most relationships, this can be done by updating either foreign key fields or navigation properties. For many-to-many relationships, the Entity Framework doesn't expose the join table directly, so you add and remove entities to and from the appropriate navigation properties. The Course views are already scaffolded with drop-down lists for the department field, but you don't want the DepartmentID caption for this field, so make the following highlighted change to the Views\Course\Create.vbhtml file to change the caption. Make the same change in Views\Course\Edit.vbhtml. 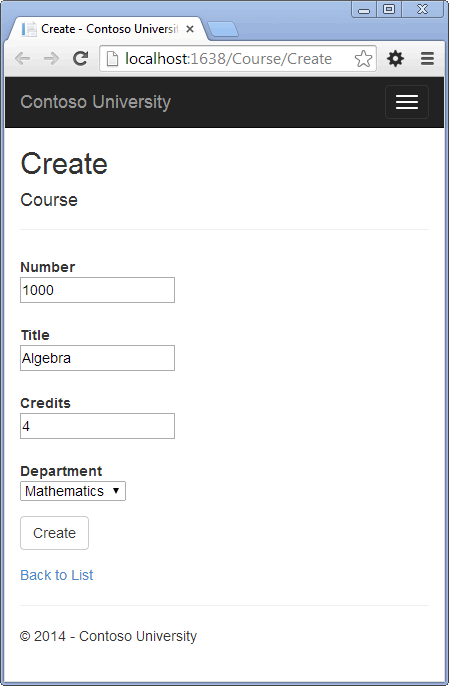 In Views\Course\Edit.vbhtml, add a course number field before the Title field. Because it's the primary key, it's displayed, but it can't be changed. 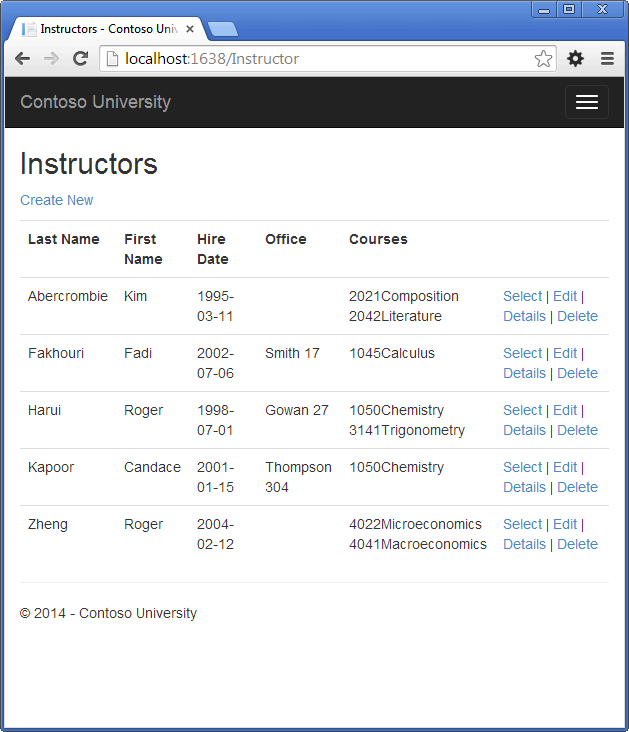 In Views\Course\Delete.vbhtml and Views\Course\Details.vbhtml, change the department name caption from "Name" to "Department" and add a course number field before the Title field. The reference to RetryLimitExceededException requires an Imports statement; to add it, click once on RetryLimitExceededException and press Shift+Alt+F10. Select Import ' System.Data.Entity.Infrastructure'. In InstructorController.vb, replace the HttpGet Edit method with the following code. The changes are highlighted. This code creates an HTML table that has three columns. The data is projected into a collection of anonymous types using the overload of the Select function that incorporates each elements index. Each type is given an Index property that is calculated by dividing its index (-1) by 3 and then converted to an integer to remove any decimal places. The first three elements will have an Index value of 0. The next 3 will have an Index value of 1 and so on. The data is then grouped by that Index value, so the first group consists of the first 3 elements; the second group consist of the 4th, 5th and 6th element and so on. Each group is output as a row in the table. 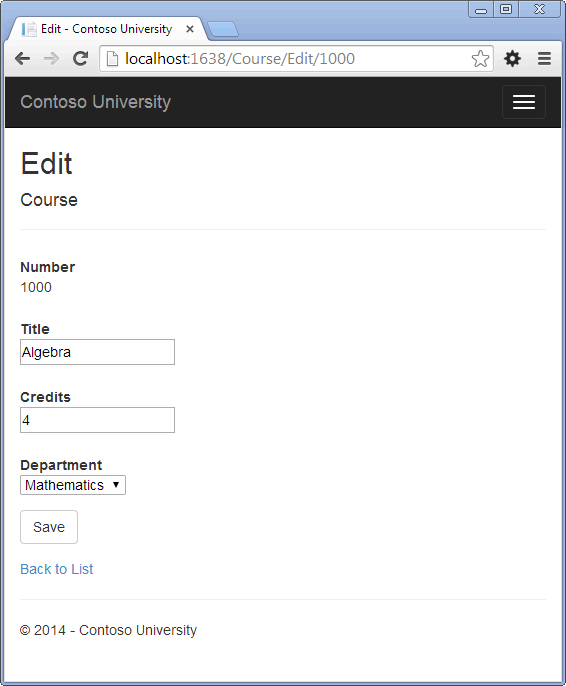 Each column contains a check box followed by a caption that consists of the course number and title. The check boxes all have the same name ("selectedCourses"), which informs the model binder that they are to be treated as a group. 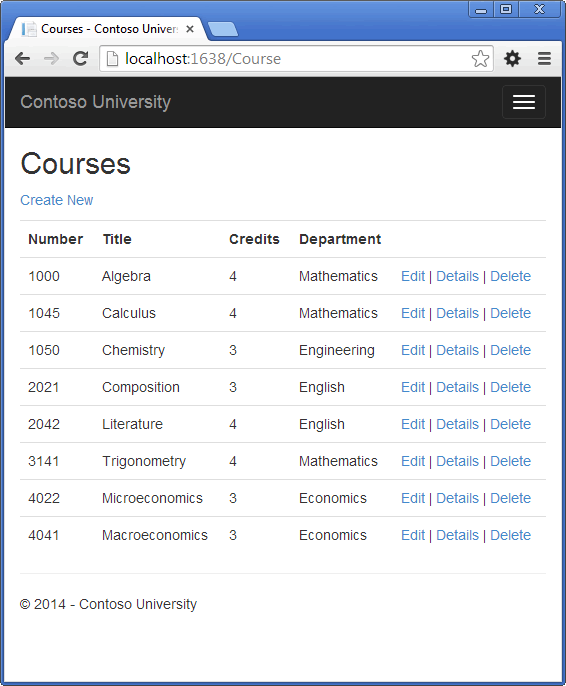 The value attribute of each check box is set to the value of CourseID. 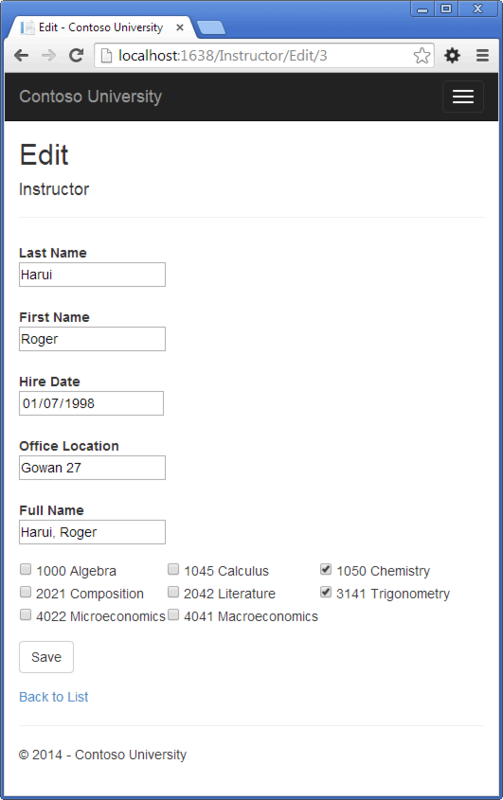 When the page is posted, the model binder passes an array to the controller that consists of the CourseID values for only the check boxes which are selected. In InstructorController.vb, delete the DeleteConfirmed method and insert the following code in its place. Deletes the office assignment record (if any) when the instructor is deleted. This code is similar to what you saw for the Edit methods except that initially no courses are selected. The HttpGet Create method calls the PopulateAssignedCourseData method not because there might be courses selected but in order to provide an empty collection for the For Each loop in the view (otherwise the view code would throw a null reference exception). 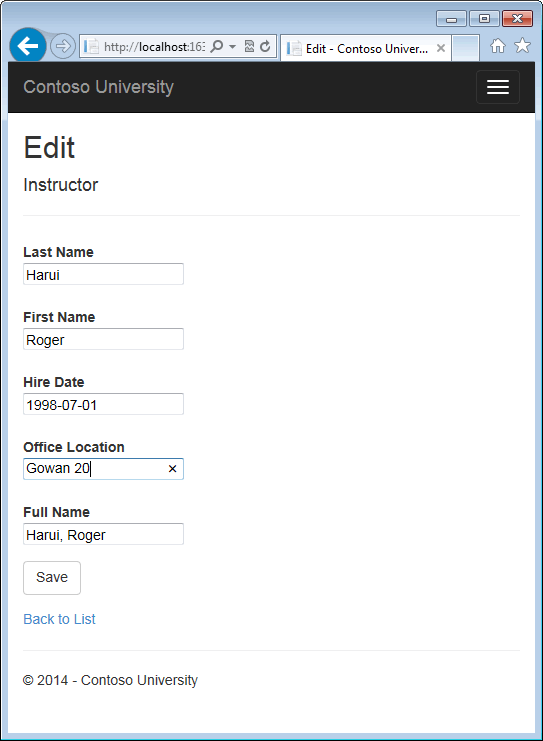 In Views\Instructor\Create.vbhtml, add an office location text box and course check boxes after the hire date field and before the Submit button. As explained in the Basic CRUD Functionality tutorial, by default the Entity Framework implicitly implements transactions. For scenarios where you need more control -- for example, if you want to include operations done outside of Entity Framework in a transaction - see Working with Transactions on MSDN. You have now completed this introduction to working with related data. So far in these tutorials you've worked with code that does synchronous I/O. You can make the application use web server resources more efficiently by implementing asynchronous code, and that's what you'll do in the next tutorial.